I have covered the U.S. Open with daily columns of the past and present college and junior players for eleven years straight. I attended the Open and did stories for many years before that. A medical problem forced me to miss this year's tournament. It was tough for me to watch from the television at home, but just because I wasn't there doesn't mean I don't want to give credit to some of the top performers who I've watched in the juniors over the years, and those who used college tennis as a stepping stone to professional careers. 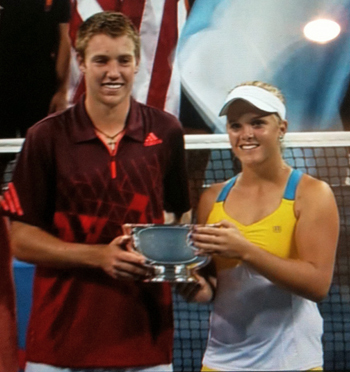 Melanie Oudin & Jack Sock-What can I say? I told you so? I've been touting these two for years, Melanie since I saw her as a 13 year old at the Girls' 16 Nationals, Jack as a 14 year old who had just one every national singles and doubles title in the 12s. They are two of the most talented players I've seen through the years. When I heard they were playing Mixed Doubles together, I knew they would go far, though even I couldn't predict they would take it all the way and win the title! Jack (18) and Melanie (19), who were wildcards, are the youngest team to ever pick up the crown. Christina McHale-As long as we are on the subject of impressive, this 19 year old is the youngest American in the top 100, now sitting at No. 45. I've actually known Christina since she was playing the 10s at tournaments at the Port Washington Tennis Academy, along with sister Lauren (currently playing college tennis at the University of North Carolina). Christina remains one of the best mental players among teenagers and she's been proving her game as well. Her win over eighth seeded Marion Bartoli -- after a summer that included a victory over No. 1 Caroline Wozniaki -- gave her a top 50 ranking and the respect she deserves. Taylor Townsend-Fifteen year old Taylor Townsend captured quit a bit of attention in as she won a round in Qualifying women's singles. After that, she joined Jessica Pegula in the women's doubles draw and made it all the way to the round of 16. Then, she teamed with Gabby Andrews to make the finals of the US Open Junior Girls' Doubles Championship! The talented teen made fans all over the USTA Billie Jean King National Tennis Center. Grace Min-Grace is another player who has been a winning fixture on the junior circuit since she was about 10 years old. She and Lynn Herring formed a dynamic doubles duo for years -- and they both continued to win on the singles front. Lauren went off to college (Georgia) and Grace still has a year to make the decision. In the meantime, she's polishing her skills and showing them off. This week that meant capturing the U.S. Open Junior Girls Singles Championship -- unseeded. She's the first American to do it since CoCo Vandeweghe in 2008 . Donald Young-Before Jack Sock did it this year and last, Donald Young was the last player to win back-to-back singles titles at the Boys Nationals at Kalamazoo. Donald was already a pro by then, as he was when he won the Junior Boys' Singles at Wimbledon and the US Open Junior Boys' Doubles in 2005 . When he didn't have spectacular results immediately, many wrote him off, but Donald is only 22 and he showed that he's just getting started by beating seeds Stanislas Wawrinka (14) and Juan Ignacio Chela (24). He lost to No. 4 Andy Murray, who Donald -- now ranked 57 in the world -- had beaten at Indian Wells. Lisa Raymond (Florida)- This two time NCAA singles champion is still going strong. 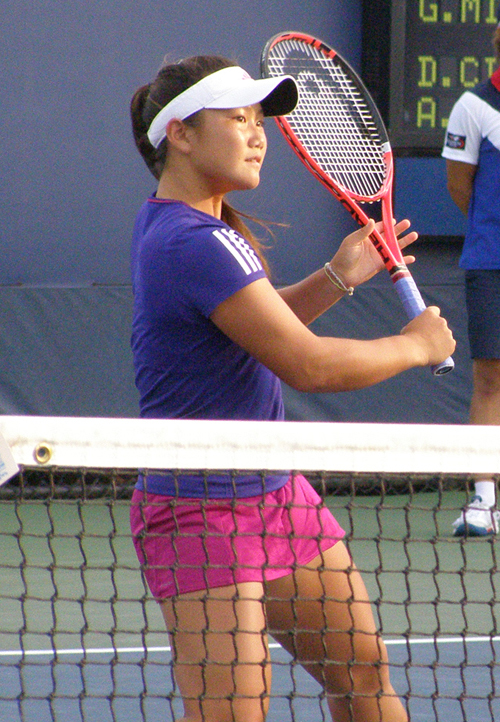 She teamed with Liezel Huber for the women's doubles title at the 2011 US Open. It is her 10th Grand Slam championship. John Isner (Georgia)-John has been an important fixture on the men's tour since he finished his four years of playing college tennis in 2007. At this year's US Open, John was the Ace leader with 94 perfect serves. He also made it to the quarterfinals of men's singles, before falling to Andy Murray in a fourth set tiebreaker. He is now ranked No. 18 in the world. Kevin Anderson (Illinois)-It seems like yesterday when Kevin Anderson and John Isner were facing off in college tennis, but all those competitions got them both ready for the pros. Kevin made it to the third round at the Open this year before he lost to Mardy Fish. That result, and wins this summer over top players like Andy Murray, have Kevin up to No. 34 in the world. 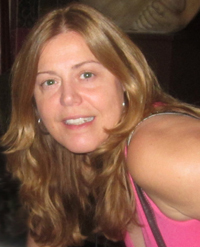 Irina Falconi-Like Christina McHale, Irina lived in the east and I saw her play quite a bit as a youngster. Ironically, when she moved to Florida to train harder, she had some injuries wasn't as much of a fixture on the juniior circuit. That changed at the end of her junior career and her results caught the attention of Georgia Tech Coach Bryan Shelton. She was a top player during her year at school, and turned pro after some good results on the circuit. At this year's US Open, she made the third round of women's singles as well as the quarterfinals of mixed doubles -- with NCAA champion Steve Johnson, a senior at Southern California. For more on the college and junior player matches at the US Open, check out Colette Lewis' Zoo Tennis.